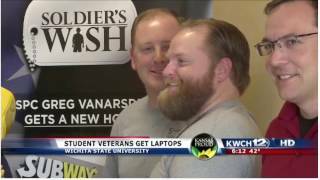 SSG James Mote has served his country and is now in the process of completing his education. Both he and his son are in college, and they have both been faced with the hardships of not having computers to do their studies. Mote’s wife developed a strong form of cancer that she is still battling. His son also developed the same kind of cancer and is in remission. Both of their cases have caused a large amount of medical bills to pile up, so when Mote’s computer broke, there was no way for him to replace it. 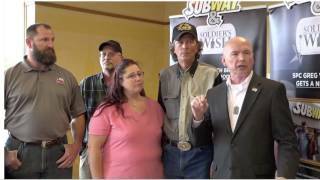 Soldier’s Wish and Subway stepped forward to provide both soldiers with a new computer. Now they can both continue their education together. Thank you, SSG Mote for your service.